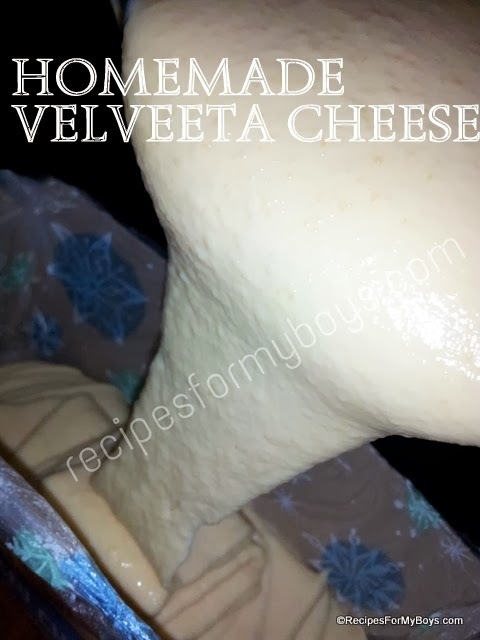 I was so excited to see Michael Symon's alternative recipe for Velveeta Cheese on "The Chew" yesterday. It seems there is a shortage of Velveeta in the east. Most certainly due to the polar vortex that has disrupted the realm of living recently, with unspeakably COLD temperatures. Thankfully, we live in Florida, We fuss and complain when the weather gets below 50. BRRR! I know...I know! We have a heat wave compared to most. Stay warm and safe, dear friends. 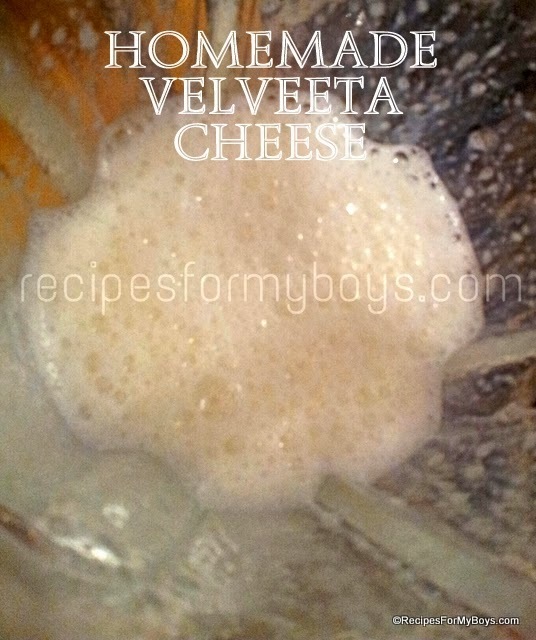 If you are out of the smooth and velvety orange cheese...here is a fix for your Velveeta Cheese cravings. 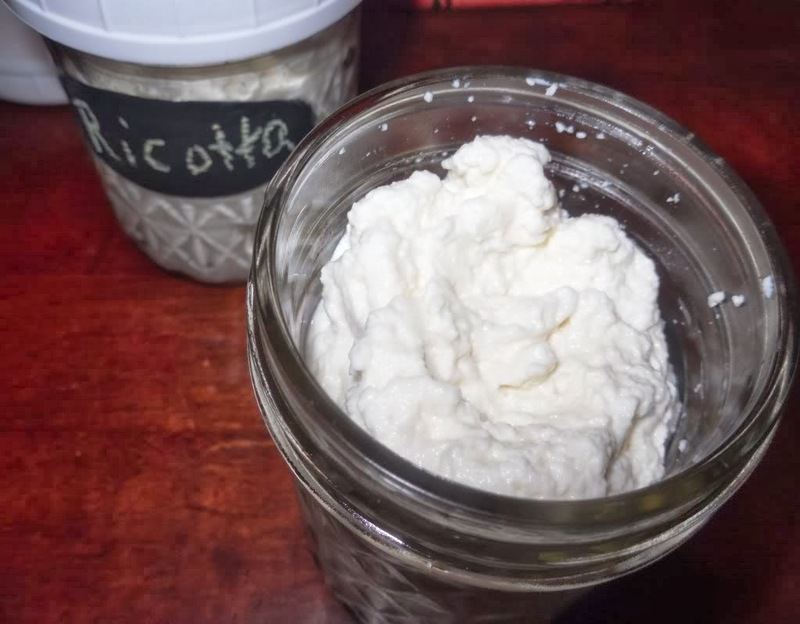 Michael Symon's recipe uses 1 cup of each cheese. I increased the amount. You can also use all cheddar cheese instead of the three. Add water, powdered milk and gelatin to blender. 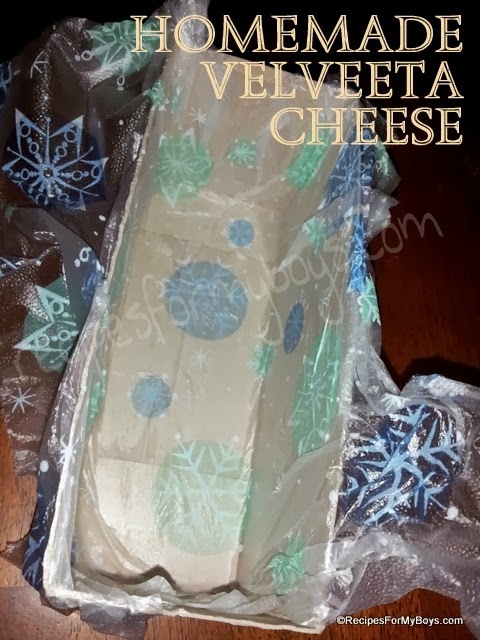 Line a mold with plastic wrap or press and seal. This is a Cheez-It box with a length of 6 1/2". I cut it at 3 1/2" depth. Pour into prepared mold. I don't know why the cheese isn't orange. Put in refrigerator to set. 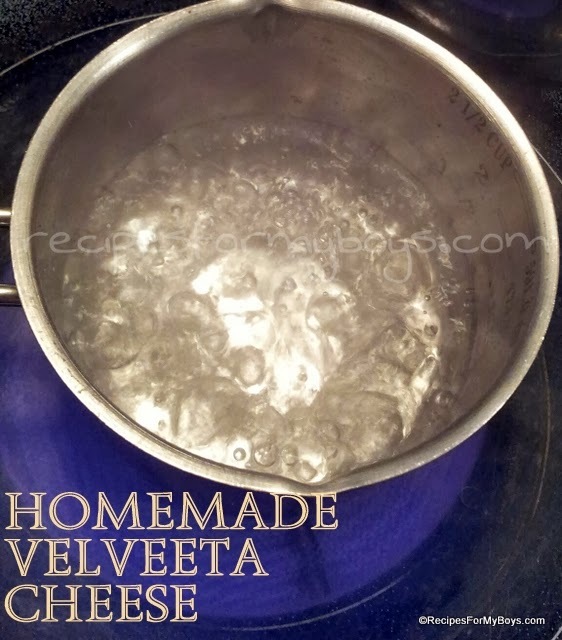 A great alternative to Velveeta Cheese. 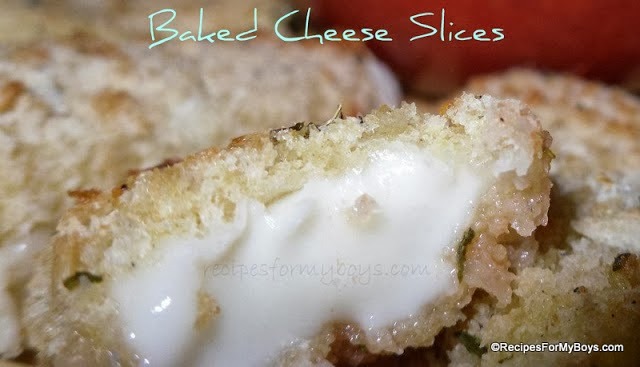 Melts smoothly and tastes great! Put water on to boil. Line your selected, prepared mold* with plastic wrap, set aside. Once water has boiled, add to blender. Sprinkle in dried milk and unflavored gelatin. Pulse to blend. 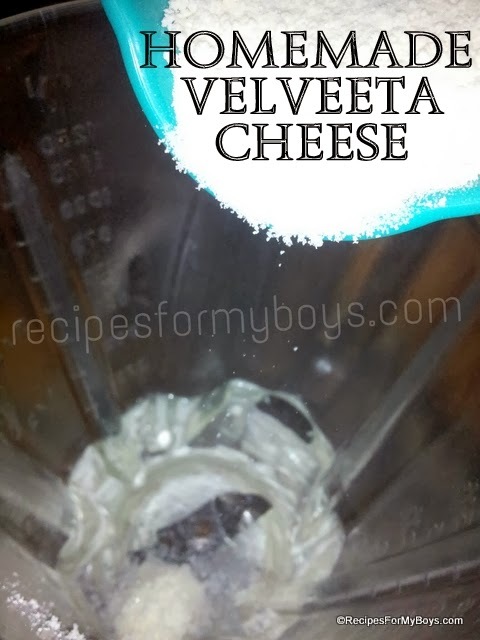 Add shredded cheese and blend until smooth. 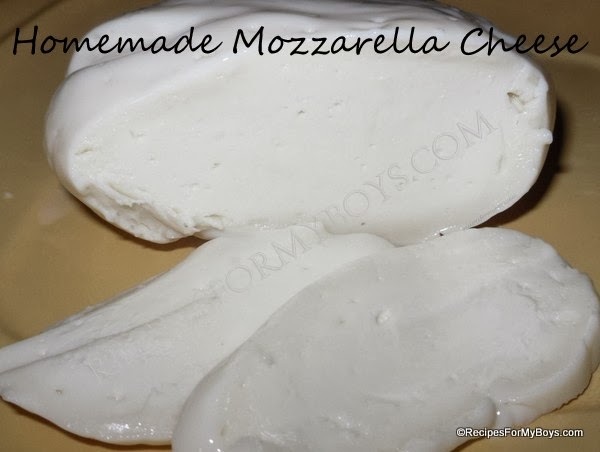 Immediately** pour into prepared mold. Put in refrigerator until set, about 2 hours to overnight. Take out of refrigerator, remove from mold and enjoy! Keep refrigerated. * I made a mold by cutting a Cheez-It cracker box 3 1/2" up from the bottom. It's length is 6 1/2". I lined it with press and seal, plastic wrap will work great, also. **The cheese will set up immediately. 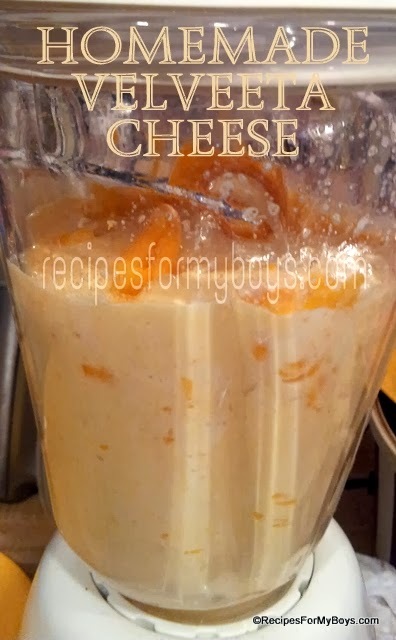 Pour into mold as soon as you stop the blender.